I’m really not the person who should be reviewing Silences EDP Sublime. I don’t do florals, much less green florals. I consider them the domain of more elegant women (I define an elegant woman as one who eats something other than Fruity Pebbles for breakfast). Unfortunately for y’all, I’m pretty much the only person out there who has a sample right now! 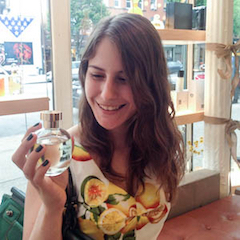 Silences EDP Sublime does not appear to be available outside of the brick-and-mortar Henri Bendel yet, but the very kind Jacomo rep gave me a sample at Sniffapalooza. Silences opens with thrillingly harsh galbanum. It initially reminds me of Maison Martin Margiela Untitled, which smelled something like Chanel No. 19 smoking a cigarette. This is my favorite stage of the fragrance. The crispness quickly gives way to a softer, more floral feel, roses and a gentle hint of fruitiness. Jacomo’s note list identifies this as blackcurrent, and I don’t know what blackcurrent smells like on its own, but I can say that Silences reminds me very strongly of Puredistance I, another lovely green floral with blackcurrent. The drydown is a standard clean musk that mingles nicely with the green notes that came before it. I’m not sure how much fans of the original Jacomo Silences will enjoy Silences EDP Sublime. The Non-Blonde describes vintage Silences as one of “the meanest and greenest oakmoss bombs” of the 1970s, and this modern version is certainly not that. The galbanum note loses its bitchiness after ten minutes max, there’s no oakmoss, and this is undeniably not a chypre. It is, however, an attractive and reasonably-priced addition to the prim green floral category. I wish that more reformulations of classic vintage fragrances turned out this nicely. ‹ PreviousHappy New Year From Scents Of Self! You poor Texan! It pisses me off to no end that Henri Bendel only offers its fantastic perfume selection in-store, not online. So annoying! I think the Dallas and Houston folks are a lot better off than us Austinites. But yeah. Glad that I’m not the only one who finds Bendel’s site infuriating! I have the Vintage and love it, can’t wait to try Sublime to compare. Thanks Arielle. Do you think they’ll have it more available in Europe? I will be there in late Jan, that’s why I asked. Oooh, how exciting! Where are you going? If you’re going to London, will you promise me to drag Drew out to a Perfume Lovers event?? Not doing London this time I’m thinking in May though. Poor Drew out with an 8″ 120kg man in a dress in London. It could be the undoing of him. I will be based up in Oxford which is close enough for forays into the wilds of town. Jin has organised the tour of a lifetime. We visit his brother in Slovenia, then Prague, drop in on Birgit in Vienna, Budapest, Venice and then Paris. As if that wasn’t enough we then go meet his parents in Korea. 5 beyond incredible weeks, I can’t believe it. AAAAAAAUUGH! Where did you get a sample to test????? Srsly. Dying here. You’re so distraught that you missed the first paragraph, where I said I got it at Sniffapalooza! 😉 May I send you my sample, Mals? I think you will get a lot more wear out of it than I would. BLESS YOUR HEART! I’ve been tempted to just buy the darn thing unsniffed, but that’s nearly always a bad idea. And you really must smell the original for comparison before you send me the new sample. I am completely stocked on Silences PdT, so I would be happy to send you some and then wonder how far out of your socks you get knocked by it. It is a floral even in its original version, but not a shy one. Yes yes yes! A Silences trade! I will email you my mailing address tomorrow. Silences was the fragrance that made me a convert of galbanum, but my favorite part is the jasmine/rose combo that takes over after the galbanum finishes. And there’s blackcurrant in it now? Now I’m really interested. Dionne, if your favorite part is the rose after the galbanum, I can practically guarantee that you will like this new Silences. I love Silences. Green, galbanum. What’s not to love? Really want to try the reformulation. Looks like a trip to NYC is in order. Now to only find the time and $$$ to swing such a thing. And I was hoping to keep my lemmings manageable this year. LOL. Is there a date for the spring Sniffa yet? I didn’t see any emails in my inbox. And there is much more to do and see in NYC than just perfume, so the trip would totally be worth it. I was impressed by this as well. If only because other reformulations are so disappointing! A good one really, really stands out. Thanks for this great review. Looking forward to this one now. I was actually having people compare Silences to No.19 today, with the overall consensus being No.19 smells better. But I’m not convinced, I think it’s just that people can’t get on board with galbanum unless they’re aware of what they’re smelling. Even then, guess it’s an acquired taste. Maybe adding fruit to it will help! Ah yes, you’re another Silences fan, aren’t you? I love both Silences and No. 19, but for different reasons – and Silences actually smells more floral to me than 19. I’m so glad you liked it, Bryan! I just can’t understand not loving galbanum. How can you help but adore a perfume that growls at you?? But I hope that you’re right, and that the blackcurrent will convince some new Silence lovers! Great post. I have been skirting the Silences vintage for a while wanting to test it out….and now this comes along and sounds wonderful too. So many perfumes and not enough cash! Thank you, laniersmith! And ain’t that the truth. That’s why it’s so nice to see this one (relatively) reasonably priced for a niche perfume! I love galbanum! No 19, Untitled, old(er) Silences so I just must try this new one! I hope you get to! It’s always exciting to find something new that you just know you’ll love!